​This rugged and rustic-style piece is crafted from a company that knows woodworking and furniture building to the extreme. It embodies a design quality that is coming back to popularity in modern design and architecture. 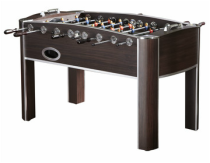 It is expertly crafted from engineered wood and dark brown maple veneer. When it comes to how we rate tables, just know the aesthetics of this table make the price point higher. It features a classic parquet playing surface, manual scorers, and green and white players. Adjustable leg levelers keep this piece level even on uneven surfaces. 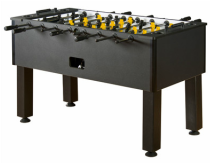 The aspect this table is lacking is the foosball men with pointed toe design, as it features rounded toes that make it harder to control the ball and shoot complex shots. 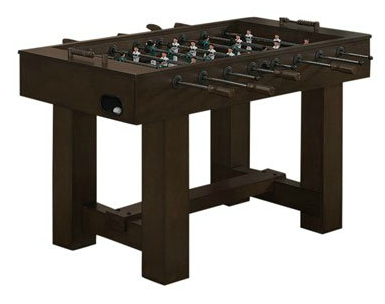 Overall, this fits in the furniture-grade table that loses a little focus on the advanced playing aspects of the game. 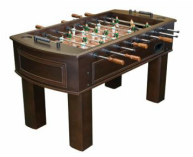 This table is rated 3 out of 5 foosballs.